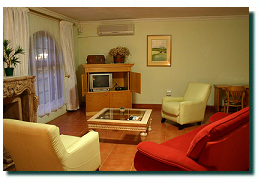 This picturesque establishment offers spacious & luxurious, Bed and Breakfast accommodation, for the discerning travelling businessman, as well as top class Self-Catering chalets for the weary weekend guest, looking to get away for a well deserved break, and just to relax around the swimming pool with the sounds of nature. Beethoven Lodge also has a choice of air-conditioned Conference venues, one being a room for up to 25 persons and the other for conferences up to 40 persons. 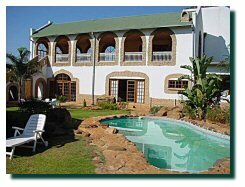 Nestled on the Eastern side of the Dam, amongst the Magalies Mountains, Beethoven Lodge is conveniently situated within the scenic panorama of the Hartbeespoort Dam valley, just off the R511, only 35 minutes from Johannesburg & Pretoria, 10 minutes from Brits & 75 minutes from the Pilanesberg Game Reserve, Sun City & The Palace of the Lost City. This 5 hectare property is well secured with palisade fencing and an electric gate, and for our guests extra peace of mind, we also have a security guard patrolling the property at night. We are 1km from the main shopping centre, the medical centre and a garage, in Ifafi, and there are 7 Pubs & Restaurants within 3km of us, allowing our guests to enjoy a variety of different cuisines. 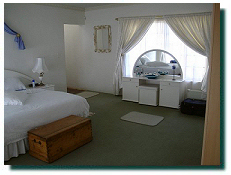 Our luxury B&B suites consist of a bedroom, small lounge & have bathrooms en-suite (all with showers, and some with baths), and are equipped with a fridge, and have tea & coffee facilities as well. All the suites have a TV with their own DSTV decoder and remote control, and there are 20 channels enabled. Most of the suites are Air-Conditioned, but the few that are not have fans for summer and heaters for the winter. Our Breakfasts are well renowned and consist of a variety of Fruits, Yogurts Mueslis, Juice, Cold meats, Cheese, as well as a full English breakfast of Bacon & Eggs, toast etc, & Teas and Coffee. Our spacious 80sq meter, 2-bedroom, 4 sleeper chalets (one double & two single beds) are fully equipped with towels, linen, crockery and cutlery as well as pots and pans. They have a fridge, a microwave, 3 plate stove top, as well as all the basic kitchen equipment required. Each chalet has a TV with its own DSTV decoder with 20 channels enabled as a Hotel bouquet. The bathroom has both a bath and separate shower. In the bedrooms and lounge there are ceiling fans for the warm summer days and the lounge has a fireplace for those cosy cool winter nights. The chalets have their own braai area and undercover parking. 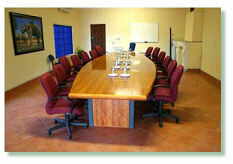 * The Air-conditioned Boardroom conference room & balcony, with a magnificent view of the Magalies mountain range, accommodating 25 delegates. * Breakaway rooms are also available on request.